The smell of the flowers blooming throughout the valleys begins to tickle your nose, the birds begin to sing in the early morning hours and the sun rises, the crisp breeze of spring is in the air, and Colorado’s spring season is in full swing. Colorado in may might just be the very best time to see this grand vast land. The mountain peaks that feed the rivers below them are still dusted with the soft touch of winter, and as you drive through the Rocky Mountains you’ll get to soak in the suns golden rays and watch the snow melt away. Here’s why you should make your visit to the high country this spring. The mountains still basking in their winter vails are extremely majestic. Driving anywhere in Colorado is all that much better from the views alone. Allow more time to travel as you will definitely want to pull off the road to take some picture and the windy mountain highways may not be familiar if you’re used to traveling on flat land. May is a peak time for those to travel who wish to avoid crowds and take advantage of some great deals during their stay. For a few weeks, the popular ski resorts appear to be nearly ghost towns after the slopes close down and locals head out of town before the busy time starts up again. You’ll feel like you almost have the place to yourself and won’t have to wait to get sat for dinner or surrounded by other visitors on a hike. There may be some restaurants closed, but you definitely won’t miss out. You can find delicious grub and cold drinks for discounted prices throughout the month of May, as well as not pay an extreme amount for your hotel or Airbnb. Eating out tends to get expensive in the popular mountain towns across Colorado, so if you want to save some money on your vacation, May is your month! Where other than this beautiful land can you see a moose strolling down the street right after you made friends with a fox on the back porch. The amount of wildlife in the mountains is definitely something to get excited about. There are 24.5 million acres of forested landscape that hold many different types of critters. If you have an active lifestyle but you strive to venture out into the wild by yourself, spring in Colorado should set you up for success. 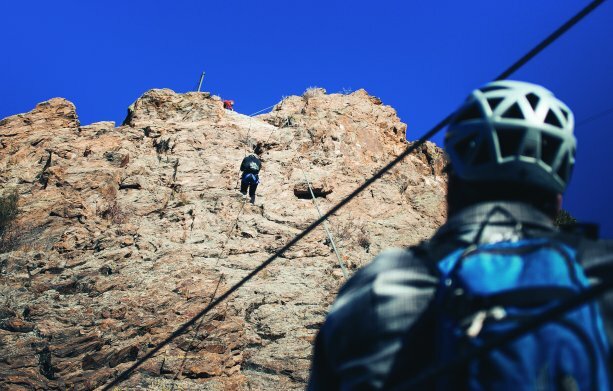 With biking, hiking, swimming, horseback riding, rafting, rock climbing, and fly fishing, there really are endless activities to keep you busy in May at a reasonable cost. Head to the mountains before the streets crowd up again come Memorial Day! AVA Rafting & Zipline is already paddling the Arkansas River as well as flying high on our zipline and via ferrata courses. With a multitude of activities starting up in the next few weeks, we have adventures for skill levels and ages!